Two spacecraft are en-route to the International Space Station after successful launches from Russia and the United States to keep up a steady chain of supplies for the six crew members living and working in orbit. 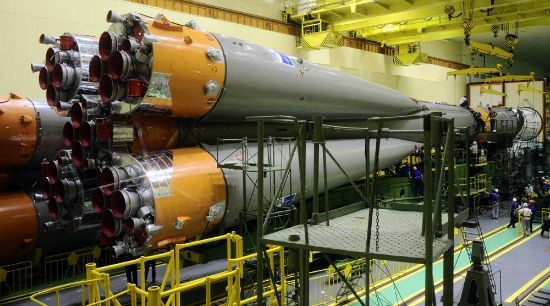 Russia’s Progress MS-03 spacecraft is first in line to pull into port Monday night after a pre-dawn liftoff from the Baikonur Cosmodrome on Sunday utilizing the Soyuz workhorse for its ride to orbit. Next up will be the SpaceX Dragon, lofted into orbit in the early hours on Monday by a Falcon 9 rocket. 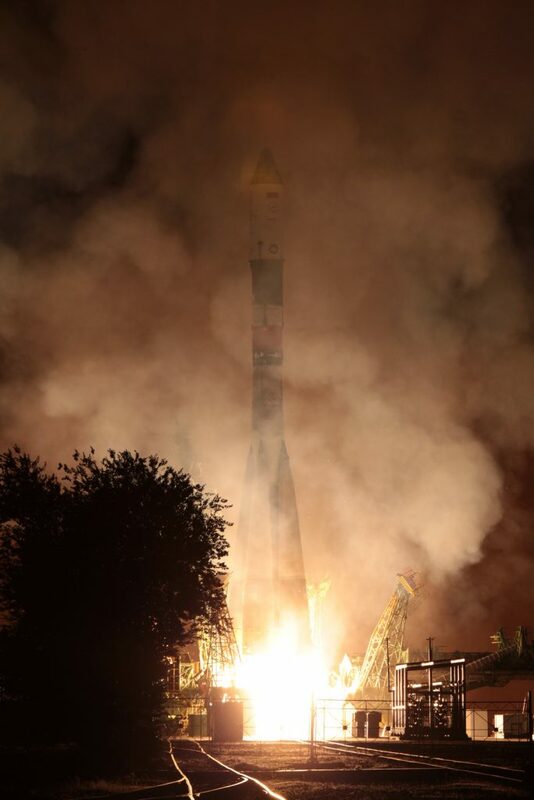 Loaded with 2,405 Kilograms of cargo, Progress MS-03 lifted off atop a Soyuz U rocket at 21:41 UTC on Saturday for a nine-minute ride into orbit. 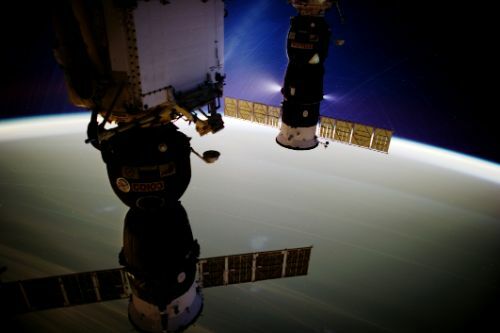 Soyuz U – approaching the end of a career of over four decades – delivered a flawless performance and released the 7,280-Kilogram Progress into an orbit of 193.8 by 242.5 Kilometers at an inclination of 51.65 degrees – very close to the 193 x 245 km target. 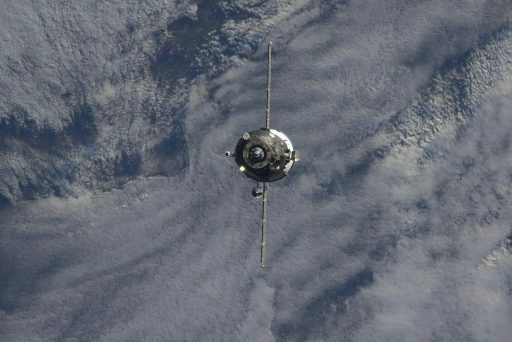 Dropped off well below the Station’s 400-Kilometer orbit, Progress had to catch up almost an entire lap around the planet, starting out in an orbit at a 329-degree phase angle to the Space Station. Following its on-target injection, Progress completed its first steps in orbit by deploying its two power-generating solar arrays and the forward KURS navigation antennas. 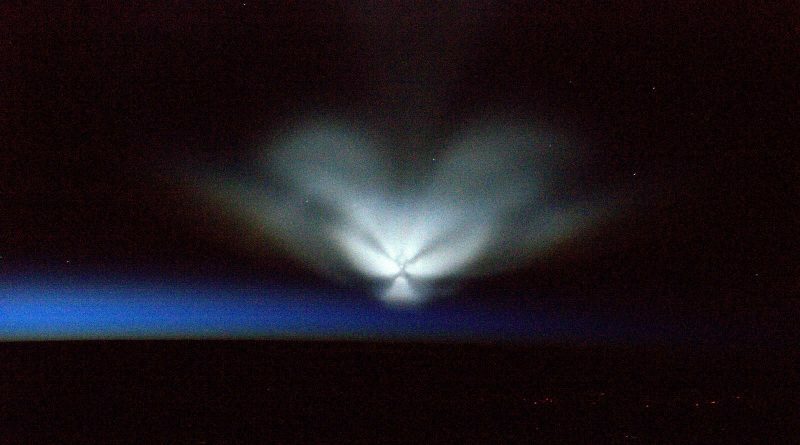 Progress pressurized its Propulsion System and Mission Controllers in Moscow were closely watching a Flight Control System test putting both data strings of the vehicle through an automated checkout. To make its way up to the Space Station, Progress executed a pair of engine burns on its third lap around the planet using its KTDU-80 main propulsion system. 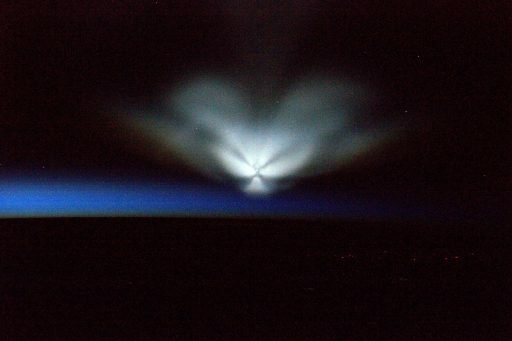 The two burns, each over 50 seconds in duration, and a clean-up maneuver on the 18th orbit placed the Progress in an orbit of 277 by 284 Kilometers where it continues to catch up with ISS from behind and below. Progress MS-03 is taking the scenic route to ISS, sticking to the conventional 34-orbit rendezvous profile in order to provide Mission Controllers time for continued testing of the modified systems inaugurated on the Progress and Soyuz MS spacecraft. These systems have flown four times – three times on the unpiloted Progress and the crewed Soyuz MS-01 mission that completed a flawless two-day link-up with the Space Station July 7-9. Beginning on the first orbit of the mission, Progress pointed its new phased array communications antenna towards a Luch 5 satellite in Geostationary Orbit. Similar to the American Tracking and Data Relay Satellite System, Luch uses satellites in Geostationary Orbit to relay data to and from spacecraft in lower orbits to provide near-continuous communications during the majority of the craft’s orbit, marking a major improvement over the previous communications architecture that purely relied on ground stations in and around the Russian territory. At 22:03 UTC on Monday, Progress MS-03 will initiate its Automated Rendezvous Sequence, beginning with the DV-4 impulse burn to put the craft on a trajectory into the 200-Kilometer communications zone around the Space Station. 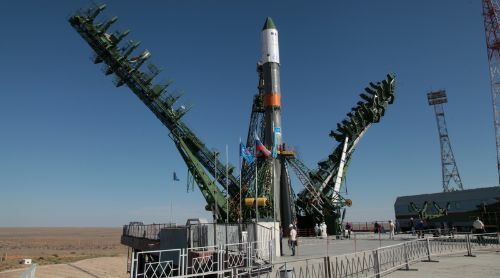 At 22:50 UTC, the Progress will activate its new KURS-NA radio navigation system with its counterpart on ISS, KURS-P, being powered up as well. 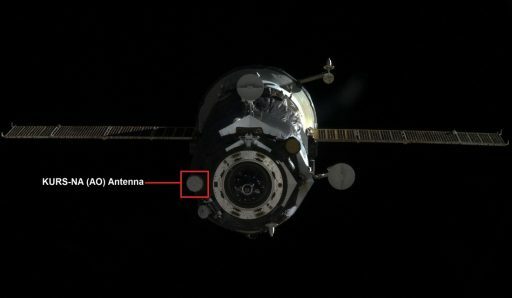 Starting the far-field phase of the rendezvous, KURS-NA will search for the direction of the Station’s signal to point the forward-facing KURS antennas toward ISS, an orientation known as Line Of Sight (LOS) attitude. Once in LOS mode, the new AO-753A phased array antenna that replaces the complex 2AO rotating KURS antenna can deliver pitch and LOS angle measurements between Soyuz and ISS. Closer in, the two ASF-1 antennas, retained from the previous KURS-A system, will lock onto the Station’s signals to deliver range and range rate in addition to angular information. Using KURS data, Progress will complete one more large rendezvous impulse, aiming for a point one Kilometer from ISS – an intentional targeting offset that allows Progress to harmlessly drift past ISS in case of a problem during rendezvous. The entire early rendezvous portion will be covered by the Luch 5V satellite, providing communications relay from 23:05 to 0:03 UTC when Progress will be within 400 meters to ISS. During a six-minute gap until Luch-5B acquires the Progress, MCC Moscow will rely on ISS to relay the data overlay from the Progress. At a range of 15 Kilometers, Progress will complete a KURS test to make sure navigation data provided by the system is valid. Aboard ISS, the Russian crew members will be stationed inside the Zvezda Service Module where one crew member will watch over data coming in from the spacecraft and another is at the TORU controls, ready to switch Progress to remote control in case of issues during the final phase of proximity operations. A TORU test will be performed to ensure Progress responds to inputs on the Rotational and Translational Hand Controllers aboard ISS. Inside 1 Kilometer to ISS, Progress will conduct a series of braking burns with the 130-Newton DPO thrusters of the vehicle to slow down ahead of the Flyaround that is initiated at a distance of 400 meters. 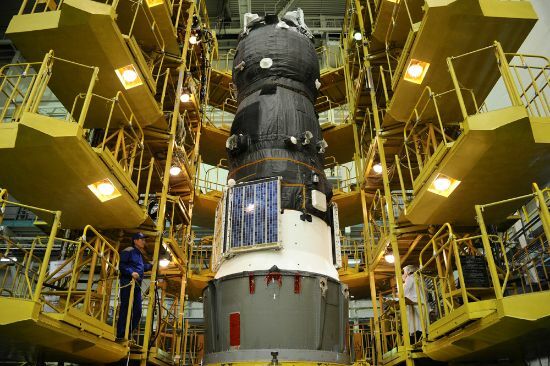 Progress MS-03 will dock to the Pirs module that has been vacant since the departure of the inaugural Progress MS spacecraft on July 3. The Flyaround will line the Progress up with Pirs at a distance of under 200 meters where the approach will be stopped to provide a moment for Mission Control to check the alignment of the spacecraft. Staring down the barrel of Pirs, Progress will gently fire its thrusters to initiate a closing rate for a ten-minute approach to the Station for docking at 0:22 UTC on Tuesday, though the exact timing will depend on the duration of the Stationkeeping period. 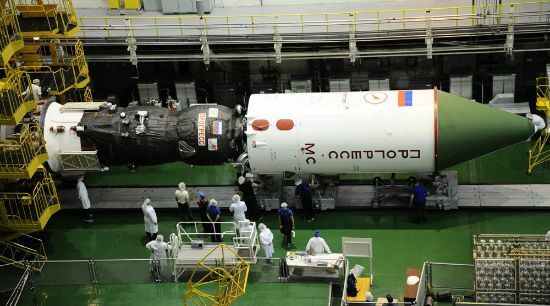 Progress is booked for a stay of five months, facilitating the delivery of 2,405 Kilograms of cargo comprised of 705 Kilograms of propellant to be transferred to the Space Station, 420kg of water to be transferred internally using portable water tanks, 50kg of pressurized air and oxygen to top up the Station’s atmosphere and 1,230 Kilograms of dry cargo including systems hardware for the Russian segment, food for the crew and supplies for their every-day life in orbit.